Stagecoach has become the first major bus operator in the country to accept smartcards for concessionary journeys on every one of its vehicles outside London. The technology now covers the Perth-based group's 19 regional bus companies in Scotland, England and Wales. It means passengers with National Concessionary Travel Scheme smartcards now simply need to place their card on the ticket machine when they board the bus and their journey will be recorded electronically. Stagecoach was the first major UK bus operator to complete the installation of Government-standard ITSO smartcard ticket machines on its entire UK bus fleet outside London. 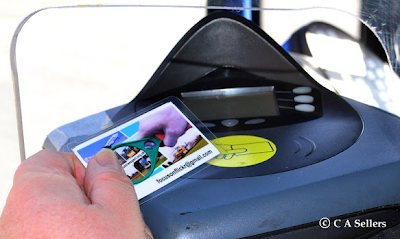 The company was also the first to accept national concessionary travel smartcards across its entire bus fleet in both Scotland and Wales and has spent the past year introducing the technology at each of its businesses across England. More than 200million concessionary smartcard transactions are now made on Stagecoach bus services across the UK each year. Stagecoach UK Bus Managing Director Les Warneford said: “This is an important milestone. After becoming the first major bus operator to install smartcard technology on all of our buses, we are now putting it to good use for the benefit of our concessionary customers whose journeys can now be recorded electronically. Stagecoach has also launched its own smartcard scheme for passengers who make standard journeys not covered by concessionary travel schemes. StagecoachSmart travel cards are already being used on its buses in Cambridgeshire, Oxfordshire, Manchester, South East and North East England. The initiative, using a system by Vix ERG, allows passengers to store their travel on an electronic card instead of using paper tickets. Bus customers can also pay for their travel through hassle-free automatic monthly payments. Stagecoach Group continues to lead the way in working towards Transport Minister Norman Baker’s vision to have all public transport covered by smartcard technology by 2020. In 2008, the Group launched the UK’s first national rail smartcard on its South West Trains franchise and ITSO smart ticketing is now live at around 100 stations on the network. In addition, season ticket holders on the Group’s East Midlands Trains franchise can now also switch from paper tickets to StagecoachSmart travel cards for travel between 26 stations on the network that are fitted with smartcard technology. And earlier this year, Stagecoach announced an integrated bus-rail smart ticketing pilot in Basingstoke, Hampshire – one of the UK’s first commercial multi-modal applications of the Government-preferred ITSO technology. The pilot allows a South West Trains rail season ticket and a Stagecoach South Megarider multi-journey bus ticket to be stored on one smartcard. The integrated bus-rail pilot will be gradually expanded in the months ahead to include more passengers and further areas.